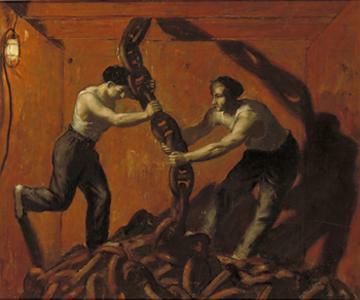 A view inside a chain-locker, with two sailors guiding the ship's anchor chain coming down from above. Before leaving for the Middle East as an official war artist, Carr took a trip on a Merchant Navy ship. He was passionately concerned that the everyday toil of servicemen and women should be recorded as part of the war artists scheme, believing this was of great public interest.